Set against the world of high stakes poker, "Deal" follows the story of Tommy Vinson, an ex-gambler who quit the game of Texas Hold'em over 30 years ago after missing a family emergency and swearing to his wife, Helen, "never again". 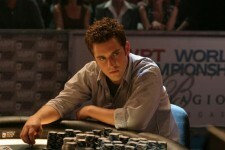 Tommy tries to be content with his luggage business but while watching a poker tournament on television, he sees someone who reminds him of his younger self, Alex Stillman. Alex is a cocky, hotshot card playing senior at Yale University. He is the best player there. Alex's parents would like him to go to law school, but Alex only dreams of playing professional poker, like the icons he sees on TV. After winning an on-line event that places him in the televised game, Alex loses early. He's close to greatness, but what he doesn't realize yet is that he focuses too much on the cards, and not the players… that's where Tommy comes in. Tommy finds Alex and makes a pact with him: he'll front Alex the high priced entry fees to all the major tournaments if Alex plays the way that Tommy wants him to. Alex resists at first, but after seeing Tommy make some impressive calls while watching a poker game together, Alex changes his mind and they partner. Alex's parents are sick about it, and Helen, Tommy's wife, is concerned that her husband will get sucked back into the game that took him away once before. Tommy promises Helen that this will not happen because he’s not the one playing, Alex is. But after Tommy and Alex have a falling out over a local Las Vegas call girl that Tommy arranged to meet Alex and whom Alex has developed feelings for, things change, and everything is off. Tommy, who's now got the appetite back for the game and a hunger to be acknowledged as the best, enters the final tournament of the poker season and ends up facing Alex, his protege, in the finals of the World Poker Tour. And what happens there, even though only one will be declared champion, leaves them both winners.